Last Christmas season, I made batch after batch of White Chocolate Christmas Popcorn Party Mix. Everyone loved it, but this year I’ve had Peppermint Bark on my mind. I don’t know why, but every time I think of making something, I think Peppermint Bark. Peppermint Bark. It’s just so festive! Well, I still haven’t made my Peppermint Bark. Mostly due to the fact that some-one got into my good chocolate. Ahem. You know who you are. I’m NOT happy at you! (It was one of my sons, and since I only have one, I have a pretty good idea which one.) And when I went back to the store, I forgot to buy more chocolate. 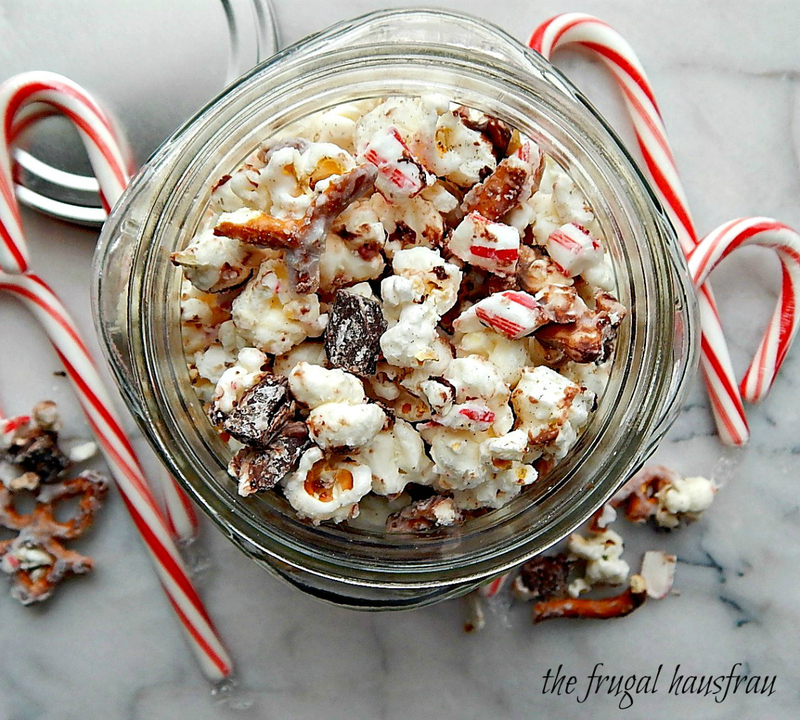 But I DID have enough chocolate chunks on hand to make this marvelous Peppermint Bark Popcorn. Talk about getting me into the Christmas spirit – this mix just screams (and tastes like) Christmas! It’s super easy and fast, too. A great little sumpin’ to make if you’re not a baker. It’s great to have on hand for snacking, and just a nice little gift, too, for a friend or a neighbor. And I’d put a big bowl or two of it out at a party with no problem! My Peppermint Bark Popcorn is a bit different than most. I just didn’t feel like drizzling chocolate. Instead, I chopped up chocolate chunks and added it to the mix. They didn’t stick well, so I tossed the whole works (it was on two large sheet trays) into the oven at 275 F. till barely warm. Then I gently turned it with a spatula. It was the best, ever! So try that extra little step if you want to…or just drizzle melted chocolate if you’d rather. Heck, it’s your popcorn! Just make it, make it with kids if you can – it’s always so much more fun to get everyone messy! And make it with a labrador who can happily eat a few stray pieces of popcorn off the floor (before it’s coated.) Lab tested, Mother approved! I started with a 1/2 cup of popcorn kernels. That makes about 16 cups (2 quarts) of popcorn, popped, according to Popcorn.org. If using microwave popcorn, multiply serving size by #of servings to figure out how many cups in the bag. You’ll need two or three. It’s not too particular. It’s really up to you how many candy canes you want to use or how many pretzels you’d like to put in. Make popcorn by your preferred method. Divide onto 2 large sheet trays. Sprinkle with salt, then sprinkle with the pretzels. In a microwave safe container, heat white chocolate for 1 minute. Stir and continue to heat in 30 second intervals until chocolate is mostly melted. Stir again and set aside for a few seconds until it is completely melted. Remove and gently turn over several times with a spatula, scraping up any residue from the bottom. Let cool and break into chunks. Note: if you’d like a lot of peppermint flavor, add 1/4 teaspoon of peppermint extract to the white chocolate during the final stir. I’ll be posting this recipe at Fiesta Friday #202, hosted this week by Judi @ cookingwithauntjuju.com and Laurena @ Life Diet Health. This entry was posted in Click here for Fabulous Food Posts and tagged Appetizer, Chocolate, Desserts, peppermint, Popcorn, pretzels, white chocolate. Bookmark the permalink. Thanks, Laura. It really is very good “filler” for all the rest of the goodies! Thanks Michele! So easy and fun! Thanks Rhonda. I’ve been actually thinking of you guys every time I see news about that fire! Prayers for you and yours! Thanks! And I know, jheez! But if I had more chocolate, I probably wouldn’t have made this! This popcorn sounds right up my alley. I love peppermint bark and now the peppermint pretzel bark on my blog too. It’s a great idea to put it in popcorn. What a great gift idea too. Merry Christmas Mollie. Hope you find a new place to stash your chocolate! Your peppermint pretzel bark is gorgeous!! Since my son now has his own place, you wouldn’t think it would be an issue anymore, right? Live & learn! Beautiful capture and sounds delicious!! Hi Thanks much! I’t s a little addictive. Salty, sweet!